…“alien” and/or animal characteristics will be introduced to the human gene pool and spread through intermarriage, altering the human genetic code and eventually eliminating humanity as we know it. According to many theologians, this is what happened before the Great Flood, allowing for Nephilim incarnation and perhaps has been the whole idea for the end times as well—to create a generation of genetically altered “fit extensions” for the resurrection of underworld Nephilim hordes in preparation of Armageddon. In the first installment of this article series, “Homo Nephilus,” we reported that the emerging Postmodern Prophecy Paradigm (PPP) leaders have corrupted the key biblical doctrines directly tied to the Gospel of salvation, beginning with the idea that the Lord God sent the Flood of Noah—not because of mankind’s sin and wickedness—but in order to stop the corruption of the human gene pool from Nephilim DNA contamination. The PPP teachers contend that these demon-human hybrids threatened to wipe out humanity in Noah's day, beckoning God’s intervention to save mankind through the Deluge. The Postmodern Prophecy Paradigm leaders also teach that space alien Nephilim creatures will be returning to earth “as in the days of Noah” to mate again with human beings and extend their own race, thus threatening the existence of mankind once again. This corruption of Scripture’s plain meaning invents a new prophecy focus in the evangelical world – that of an impending invasion by monstrous space alien soldiers! According to the theories of these PPP teachers, God Almighty sent Noah's Flood upon the earth—not because of the inherent sinfulness and wickedness of mankind—but because the human gene pool (genome) had been corrupted by “Watchers” (fallen angels/extraterrestrials/pagan gods) who mated with human women, producing an evil, mutant race of giant hybrids (demigods) called “Nephilim.” Only Noah and his family remained genetically unstained by this celestial interbreeding with mankind. These PPP teachers further claim that Jesus’s prophecy: “as it was in the days of Noah” (Matt. 24:37), really means that the “Watchers” (parents of the Nephilim/alien life) will be returning to earth through multi/hyper-dimensional portals/stargates to repeat the events in Genesis 6—ultimately threatening to wipe out humanity as we know it. Twisting and turning the Scripture upside down, modern Nephilim aficionados are preparing their students and readers for the return of the Nephilim—not the return of the Lord Jesus Christ. Extra-biblical mythology and occult lore are quickly supplanting true Bible study and holy living. Speculation and supposition are rapidly rising, replacing proper biblical exegesis. Instead of looking for the soon return of the Lord Jesus Christ with a charge to holy living, PPP adherents exhort Christians to look for signs of these dark, mutant creatures, and make plans to engage them, if necessary. GILBERT: Jesus didn’t specifically mention the Nephilim return…. He didn’t specifically say, ‘just as it was when the giants were roaming the land,’… He seems to indicate, and there are those who will interpret it this way, that what He meant was people just weren’t paying attention. They were running about, doing their thing, not paying attention to spiritual matters and suddenly, destruction comes down… So what then is it about Matthew 24 and Luke 17 that convinces you that what Jesus really meant was something He didn’t specifically say—was talking about the presence of Nephilim in the land in those days? THE ALIEN SUPER SOLDIERS ARE COMING! This is an interesting bit of video in that it may expose what some of us have been saying for over a decade. ET is here and is part of the Military/Industrial complex. Gary McKinnon who is the UK hacker the US has been trying to extradite to stand trial, announced in this video, Alien soldiers exist. This may be a stretch for some of us, but I have heard reports of this ever since I began researching Nephilim in the late 80′s. Who is Gary McKinnon, and is he a reliable and credible expert? Hardly! According to newspaper accounts, Gary McKinnon is a computer hacker who was was indicted by a federal grand jury in the Eastern District of Virginia for seven counts of computer-related crime, each of which carried a potential ten-year jail sentence. McKinnon “admitted he accessed US government computers” when he “was looking for evidence of UFOs.” He claims that he “found a log that listed non-terrestrial officers” (i.e. space aliens) and that the “US military has a secret battalion in space.” Unfortunately, Mr. McKinnon also admitted that “he was usually smoking pot when he hacked, so that prevented him from remembering the names” of these spaceships. Is there a connection between principalities or, Arche/Archon’s and the realm of the Fallen Angels? In my opinion there is and this is part of the coming great deception I have written about for over a decade now. If McKinnon is giving us credible information, then it is ground breaking and creates a link to the fallen angels openly manifesting on the earth. Jesus warns us it will be like the days of Noah when he returns. What differentiates those days is the presence of the fallen angels on the earth. If McKinnon’s information is true, and there’s no way to vet it, then we’re not in Kansas anymore. Note again that Marzulli did not derive his ideas about “Alien Super Solders”, “non-terrestrial officers,” and “Archons” from Ephesians 6—but from “ancient pagan Gnostics” and a United Kingdom hacker fighting extradition to the United States! Furthermore, note that his whole premise is founded upon UFO conspiracy theories which are not provable. These end-time PPP plots continue to sell books, DVDs, and unbiblical notions. TRANSHUMAN SOLDIERS: A ‘NEW BREED’? As if demonic tinkering with human DNA was not fantastic enough, some have further imagined and speculated that the so-called “Watchers” might need some human help in fulfilling these scary scenarios. Human beings may be creating Frankenstein-type creatures. This is based on claims that mutant humanoids can be (or are already being) created via DNA tinkering. Leading the pack in this sensational layer of apostasy is Tom Horn, who wrote and published Forbidden Gates: How Genetics, Robotics, Artificial Intelligence, Synthetic Biology, Nanotechnology and Human Enhancement Herald the Dawn of Techno-Dimensional Spiritual Warfare. Horn piggybacks his PPP false Nephilim eschatology onto the transhumanism movement in order to arrive at places never envisioned by Gene Roddenberry or Rod Serling. Transhumanism is a high-tech, bio-tech concept is working to create a physical "new breed" of man. There is also a mystical component to it that comes from Hermeticism and Theosophy. Mysticism plus science results in an emerging pseudo-science which is very popular in the New Age Movement. It is also increasingly gaining credence in the emerging evangelical postmodern prophecy movement. When Horn’s fanciful concoctions of “a new species of unrecognizably superior humans” are married to end-times biblical prophecy they become a seductively potent deception, full of ancient occult spirituality mixed with New Age UFO mysticism. But Horn is not alone in his transhuman gene-tampering ideas. Hebrew scholar and expert in biblical prophecy, Douglas Hamp, warned that we're entering into an era of genetic manipulation that will set the stage for celestial intervention into the affairs of mankind. He predicted that within the next ten years a major disclosure event will take place which will convince the public to cooperate with aliens (who are actually demons rather than ETs) to participate in the next level of evolution. These aliens are using a hybridization program, mixing human genetics with the Satanic, in order to create an army to fight Jesus upon his return, he postulated. Further, he suggested that the hybrids might be currently kept in underground facilities. Unfortunately these statements diminish Jesus Christ, our resurrected Savior, who is King of Kings and Lord of Lords, and who shall "overcome" by the sword which "proceeded out of His mouth" (Rev. 17: 14; 19:13-16). Hamp's remarks sound more like a Hollywood science fiction movie than what Jesus tells us in Scripture about the last days. Note the remarks about “we can overcome them together.” Are these men implying that Christians must use spiritual warfare, technological warfare, or some combination thereof, in order assist Jesus when He returns to earth? 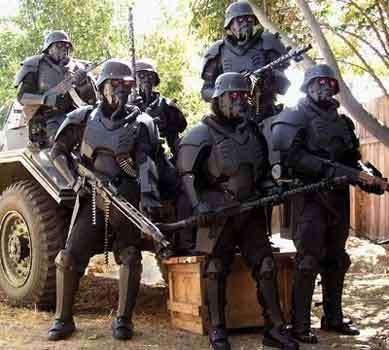 Are they saying the humankind on earth must fight off these enemy (space alien/Nephilim) combatants? This is an disturbing scenario that runs totally contrary to Scripture. Unfortunately it fits in all too well with the aberrant teachings of the New Apostolic Reformation and also the New Age Movement. Given advances in Grin technology, transhumanist aspirations, and the admitted new arms race of human enhancement discussed in previous entries, imagine the staggering spiritual warfare implications of such science if dead Nephilim tissue were discovered with intact dna and a government somewhere was willing to clone or mingle the extracted organisms for use in (re)creating the ultimate super soldier—Homo-Nephilim. 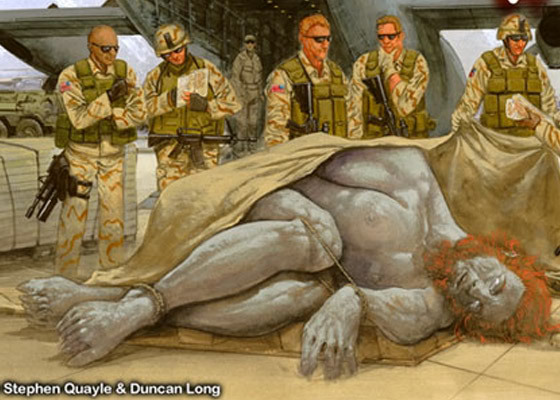 If one accepts the biblical story of Nephilim as real [Ed. Note: Horn's version of this story relies on extrabiblical sources], such discovery could actually be made someday—or perhaps already has been and was covered up. Noting that Isaiah ties the destruction of Iraq/Babylon with the reappearance of gibborim in this way, we recall how thousands of U.S. troops, on invading Iraq during the Bush administration, admittedly filled U.S. containers with archaeological materials, including what some have speculated to be cuneiform tablets pointing to the location of pure-blooded Nephilim buried in underground caves. This is exactly where Enoch said the dead antediluvian Nephilim are, and raises fascinating questions: Would agencies like Darpa have interest in studying or cloning the extinct beings if they were, or have been, found? Could man in his arrogance revive ancient dna, revitalizing or blending it with other living organisms in a way similar to what the Watchers did in making the first Nephilim? Is the factual reappearance on earth of such legendary beings verified by Isaiah, who also foresaw transhuman creatures such as satyrs (transgenic half-men, half-goats) accompanying the return of giants in the end times, or why other apocryphal books like 2 Esdras 5:8 prophesy the birth of “monsters” for the same period of time? The ancient Book of Jubilees—another apocryphal text—considers the same time frame and verifies contemporaneous Nephilim resurrection. The familiar word “corruption” turns up again in association with these beings, insinuating an end-times repeat of what the Watchers did by corrupting human dna and blending it with animals to retrofit human bodies for Nephilim incarnation. Note the graphic illustration. It is curious, considering the number of so-called witnesses to this “six-fingered cannibalistic giant,” that no one had the inclination to snap a photograph of the monster—especially if it was killed and bound in the way depicted on the book’s cover. But the unscholarly and unethical lack of documentation runs rampant throughout the PPP conspiracy theory literature. The Black Awakening has nothing to do with a specific human race. The Black Awakening does however have everything to do with another race. But what race? But the strange exploration was not limited to bloodlines. A driving search for ancient technology or information was of equal if not greater importance. Expeditions to Tibet, present day Iraq, Iran and other Middle East venues were undertaken for the purpose of acquiring knowledge or artifacts that might have been of enormous value in the development of sophisticated weapons systems. “The weaponization of the satanic powers is not a bizarre movie idea. Its [sic] something that military leaders are convinced they will need. Mil-science has been and is invaded, someone is looking over their shoulders and it is not human. The dark powers have and are supervising the development of a technology that will ensure the control of the mind along with the supernatural enhancement of fierce soldiers. “We are seeing the preparation for the most advanced, supernatural military system in the history of the world: empowered, enlarged, enlightened, transmuted, with a raging insatiable and demonic agenda. And nothing we are seeing now can prepare us for the next few years. “Of course one might argue that this could be a gradual process. This is a tragic assumption. In fact, the process will be rapid, undertaken with surprise attacks employing plagues and hi-tech, microscopic nanomachines designed to bring about the demise of its host. This won’t be a process in which one race replaces another, slowly and peacefully, even if that is the misrepresentation that most people receive. It will be violent, bloody conflict. Tom Horn collaborated with Steve Quayle and Sue Bradley in other projects that explore similar sinister end-time scenarios. Horn shares these ideas in the first part of his latest provocative new article series “Zenith 2016: Did Something Begin in 2012…That Will Zenith in 2016?” The series will be incorporated into his new book by the same title to be released soon that will be the revised and expanded version of Horn’s 2009 book, Apollyon Rising 2012. Since the pagan god Apollyon (Apollo) did not materialize in 2012 (nor any of the other doomsday predictions found in this book), Horn has apparently given the pagan deity four more years to make an appearance, as well as time to sell more books on these horrific topics (more will be written on this topic in a future article). Instead of preparing the flock of God for the return of the Lord Jesus Christ, these PPP leaders instead have concocted sensational, seductive, and satanic fables focused upon envisioned horrific hybrid combat solders. These stories are not founded nor grounded in Scripture. This end-time Nephilim return scenario negates the Lord’s admonition to readiness and godly living—with a view to His soon Second Coming (1 John 2:28; 1 Thess. 1:10; 2:19; 3:13; 4:1-18; 5:23). Note that none of the PPP myths can be clearly found in the Bible text itself. These PPP teachers rely on extreme extra-biblical sources in order to construct their fantastic end-time scenarios. The Scripture mentions four things that will be taking place on the earth prior to His return: mankind will be “eating,” “drinking,” “marrying,” and “being given in marriage.” It is obvious this is talking about men. There is NO mention of an outside demonic horde planning to corrupt the human gene pool by sexual and reproductive means! The clear implication of these sobering passages is that people—sinners—will be doing normal things up until the time judgment comes. They won’t be prepared for what happens very quickly—like the flood waters that overtook the men and women of Noah’s day. The details for this judgment are found in the Book of Revelation—and the Nephilim are conspicuously absent from all twenty-two chapters! That fact is that Jesus did not mention the Nephilim, or such a scenario, in even one of the 51 verses in Matthew 24. The context in this passage is the judgment of mankind. Plain Scripture teaches that when the Lord Jesus returns, “all the tribes of earth mourn” (v. 30), because He’s coming in judgment—a judgment which will be swift and cataclysmic, “until the day that Noe entered into the ark, and knew not until the flood came, and took them all away; so shall also the coming of the Son of man be” (Matt. 24: 38-39). Those outside of Noah’s ark (mankind) were all “taken away” in judgment. Understanding that the Lord Jesus Christ said he would return should put our focus on spreading the Gospel of Salvation to those who are unsaved. 1. Thomas R. Horn, “Forbidden Gates – Part 18”, NewsWithViews.com, November 11, 2010; http://www.newswithviews.com/Horn/thomas154.htm. Horn ‘s article series was incorporated into his book with the same name in 2010. One can only wonder who the theologians are that Horn is citing as experts on this DNA alteration. 3. Ibid, “Nephilim Eschatology: A Crash Course in the Emerging Endtime Prophecy Heresy Pt. 1”. 4. This unbiblical brand of spiritual warfare will be addressed in the next installment of this series. See also our Sept 3, 2011 article, “Militant Prayer: Taking Spiritual Dominion Over Dark Angels,” http://herescope.blogspot.com/2011/09/militant-prayer.html. 9. 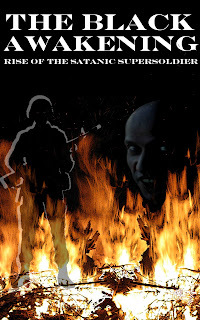 See: Marzulli’s blog, October 17, 2012, UFO News: Alien Soldiers? You be the Judge…”; http://lamarzulli.wordpress.com/2012/10/17/ufo-news-alien-soldiers-you-be-the-judge/. This article was embellished with satire by Pastor Ken Silva in “Alien Nephilim Soldiers Are Spotted”; http://apprising.org/2012/10/17/alien-nephilim-soldiers-are-spotted/. 10. See: Skiba’s website; http://www.babylonrisingbooks.com/book2/index.html. 11. See: Gaylene Goodoad, “Doomsday Datesetters 2012, Apocalypse, Planetary Birth or Deception, Pt. 1”; “The New Age and 2012: A Planetary Birth, Pt. 2”; and “Afterword by Dr. Martin Erdmann”; Herescope, June 10, 2011; http://herescope.blogspot.com/2011/06/doomsday-datesetters-2012.html; For additional insight and perspective into to these rapidly rising deceptions, See Dr. Martin Erdmann’s “The Emerging Galactic Religion,” Herescope, Feb. 28, 2013; http://herescope.blogspot.com/2013/02/the-emerging-galactic-religion.html. 12. 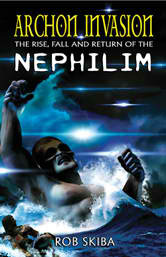 For more information on Hamp, see: “The Serpent Seed & the Nephilim: Nephilim Eschatology, Pt. 2,” Herescope, July 21, 2012; http://herescope.blogspot.com/2012/07/the-serpent-seed-nephilim.html. 13. See: YouTube interview on Coast to Coast AM with George Noory and Douglas Hamp, “The Nephilim, Genetic Manipulation & Prophecy”; originally aired 2/20/2012; posted 3/8, 2012; http://www.youtube.com/watch?v=gr9OoqxbwHQ. 14. See: “Apocalyptic Paganism in the Church: Bible Prophecy in Crisis," Herescope, March 7, 2012; http://herescope.blogspot.com/2013/03/the-rise-of-apocalyptic-paganism-in.html. 16. Thomas R. Horn, “Forbidden Gates – Part 18,” NewsWithViews.com, November 11, 2010; http://www.newswithviews.com/Horn/thomas154.htm. Horn ‘s article series was incorporated into his book with the same name in 2010. 17. See: Steve Quayle’s website: http://www.stevequayle.com/index.php?s=90. 18. See: Sue Bradley, “Secrets of the Black Awakening – Part One”, P.I.D. website, August 11, 2008; http://pidnews.com/2008/08/11/secrets-of-the-black-awakening-%e2%80%93-part-one/. See also Russ Dizdar’s website; http://www.shatterthedarkness.net/ and http://www.shatterthedarkness.net/theblackawakening/. 23. See: Tom Horn’s website, Raiders News Update (RNU), “Zenith 2016: Did Something Begin in 2012…That Will Zenith in 2016?- Part One: The Fourth Turning”, April 30, 2013; http://www.raidersnewsupdate.com/Zenith-1.htm. 24. See: Gaylene Goodroad, “Quantum Prophecy: Codes, Cosms and Cryptologies, Part 7”, Herescope, May 30, 2012; See: http://herescope.blogspot.com/2012/05/quantum-prophecy.html. 1. See: Marzulli’s blog, October 17, 2012, UFO News: Alien Soldiers? You be the Judge…”; http://lamarzulli.wordpress.com/2012/10/17/ufo-news-alien-soldiers-you-be-the-judge/. This article was embellished with satire by Pastor Ken Silva in “Alien Nephilim Soldiers Are Spotted”; http://apprising.org/2012/10/17/alien-nephilim-soldiers-are-spotted/.